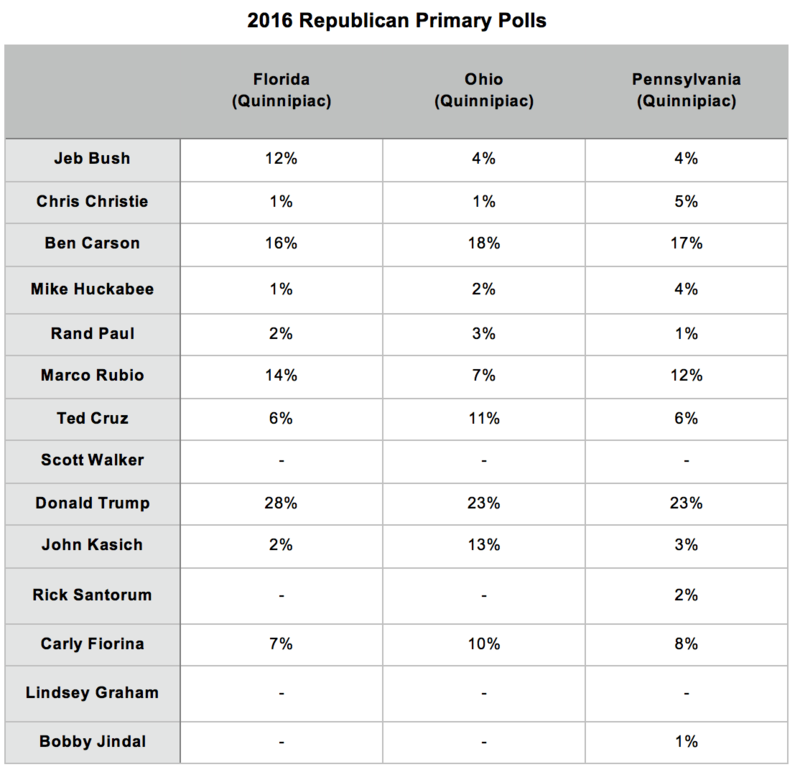 Is Marco Rubio the new favorite to win the GOP nomination? The presidential campaign silly season is upon us, and it hasn’t disappointed. But the race to succeed Barack Obama is about to get much more serious. With competition among Republicans getting tougher and the first Democratic debate on October 13, now’s a good time to take stock of the U.S. presidential race. These five facts detail which numbers to pay attention to—and which ones don’t matter. Ted Cruz is playing a slow and steady campaign, but for the firebrand Texas senator, that doesn’t translate into being quiet. In the past week alone, he has stolen supporters from fellow Republican presidential candidate Rand Paul (Ky.), won the rousing support of evangelicals and had to be shut down by Senate leaders for trying to complicate efforts on a short-term funding extension with a protest vote against Planned Parenthood funding. That reelects Cruz’s efforts to try to emerge as the consensus anti-establishment candidate if and when the top three outsider candidates, and his biggest rivals, peter out. Media tycoon Rupert Murdoch has suggested that President Barack Obama is not a “real black president.” The 84-year-old billionaire said in a tweet late Wednesday that Republican presidential candidate Ben Carson would give the U.S. “a real black president who can properly address the racial divide.” The American-Australian business magnate tweeted an apology Thursday — 12 hours after the original message — saying there was “no offense meant” and that he found “both men charming,” presumably referring to Obama and Carson. A Denver-based philanthropist who in May was appointed to the board of the pro-Hillary Clinton PAC Correct the Record has stepped down from the position and donated to the campaign to draft vice president Joe Biden into the race, POLITICO has learned. LGBT rights activist Scott Miller and his husband, mega-donor Tim Gill, each gave $25,000 to Ready for Hillary last year and have supported her candidacy and the coordinating rapid response PAC. But the couple, who over the years have given millions to progressive candidates and causes, are close to Biden and his potential entry into the race has changed the calculus for them — together they have now donated $50,000 to the Draft Biden campaign as well. Draft Biden, the political action committee created to urge Joe Biden to jump into the 2016 presidential race, has released its first national television ad in the latest sign the vice president is moving closer to a decision to run. The ad urges the vice president to run for the Democratic party’s nomination for the 2016 election, although Biden has said that he has not yet decided on a run and is weighing the matter with his family. The ad focuses on Biden’s personal history, including the deaths of his first wife and a daughter in 1972, and uses a recording of the vice president’s commencement address earlier this year at Yale, in which he talked about how that changed his life. Hillary Clinton has had aides lined up to run her debate prep for months. A Washington super lawyer is mimicking Bernie Sanders, and her top policy staffer is acting as Martin O’Malley. Sanders started studying for next Tuesday’s event not even a full week ago. And that’s because his two top aides sat him down in Burlington on Friday and asked whether he had a plan. Sanders has briefing books, a couple of meetings with policy experts and an abiding aversion to the idea of acting out a debate before it happens. He knows the stakes are high, his staff says. But the candidate, whose New Hampshire polling and fundraising prowess have put a scare into Clinton, is uninterested in going through the motions of typical debate practice.